To Reserve a Puppy, you must place a Deposit. PLACING A DEPOSIT ON AN UPCOMING LITTER, PUPPIES WILL BE PICKED IN ORDER THAT THE DEPOSITS WERE RECEIVED IN. WHEN PICKING YOUR PUPPY, IT IS DONE FROM PICTURES WE POST OF THAT LITTER ON OUR WEBSITE. AT NO TIME DO WE ALLOW YOU TO CHOOSE YOUR PUPPY IN PERSON. PUPPIES ARE VERY SUSCEPTIBLE TO DISEASES AND THE UPCOMING LITTER MAY NOT BE THE ONLY LITTER IN OUR HOUSE AT THE TIME. WHEN YOUR DEPOSIT HAS BEEN RECEIVED, YOU WILL THEN BE NOTIFIED WHERE YOU ARE ON THE WAITING LIST FOR THAT LITTER. *ALL DEPOSITS ARE NON-REFUNDABLE IF THE PUPPY OF YOUR CHOICE IS NOT AVAILABLE , IF THE PLANNED PREGNANCY DOES NOT OCCUR OR IF AN UNFORTUNATE CIRCUMSTANCE HAPPENS AND YOUR PUPPY PASSES... YOUR DEPOSIT MAY BE TRANSFERRED TO THE NEXT AVAILABLE LITTER OF YOUR CHOICE THAT IS OPEN FOR RESERVATIONS. SHOULD YOU BE UNABLE TO FULFILL YOUR COMMITMENT TOWARDS THE LITTER THAT YOU PLACED YOUR DEPOSIT, YOU WILL BE OFFERED ONE ADDITIONAL LITTER IN WHICH TO MAKE YOUR CHOICE, AFTER WHICH YOUR DEPOSIT WILL BE FORFEITED. If you are interested in placing a deposit on any of our puppies, please fill in our Puppy Application form at the bottom of this page and use PayPal to make your deposit. We NO longer accept checks of any sort. PayPal ONLY for puppy deposits and Cash ONLY for puppy pick up. When paying with PayPal your puppy deposit will be $262.00 ($250 for deposit, $12 for paypal processing fee). 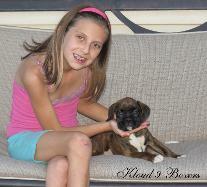 Click the Buy Now botton to reserve your Kloud 9 Boxer or Pug Puppy. Make your deposit through Pay-Pal. PLEASE UNDERSTAND THAT BY FILLING OUT A PUPPY APPLICATION, IT MUST BE FOLLOWED WITH YOUR DEPOSIT.